NC Chamber Has To Get The Last Word On Common Core? Earlier this week, I published the results of a Freedom of Information Act request that yielded a letter to the Co-Chairs of the Common Core Academic Standards Review Commission (ASRC) from Gary Salamido of the NC Chamber of Commerce. His letter pushed for revisions that would mirror rebrand states like Florida and Kentucky, while pressing for a particular course of action when it came to the ASRC hearing feedback from parents and teachers. Co-Chair Tammy Covil answered Mr. Salamido very directly — and I may add, Co-Chair Covil responded extremely accurately and honestly. Mr. Salamido apparently didn’t like being called on the carpet, and has fired off another letter to the Co-Chairs, this one even more condescending than the first. Salamido’s second letter was about one thing: Jobs. Of the 11 paragraphs, 9 were about what the Chamber wanted and needed. Most of the letter had barbs couched in them, clearly meant as shaming ploys. Not one mention of what the parents want or what the children need was in this letter. In one paragraph, Salamido characterizes Covil’s response to yet more Chamber input as “hostile” with “disregard for business organizations, their members, and their families.” It dawned on me as read this current letter and when I re-read the prior letter that when Salamido refers to feedback from parents and teachers, he means the NC Chamber’s parents and teachers. Let’s talk about hostility and disregard. Who was it threatening campaign donations again? The NC Chamber has been nothing but “hostile” and has disregarded the parents of North Carolina from the start. The Chamber instead has built a well-funded coalition of businesses called “Hire Standards” to crush the voices of opposition — namely parents, students and teachers. Mr. Salamido’s hypocrisy is truly incredible. Business has a place at the table, Mr. Salamido, however, business now seems to own the table and all the chairs around it these days. Your second letter reveals very clearly that you don’t like someone bringing their own chair and refusing to vacate it. The final paragraph made me chuckle. I sincerely hope the irony of it is not lost on the author. A shorter translation would be, ‘Be reasonable, do it our way’. This entry was posted in Academic Standards Review Commission, Common Core and tagged ASRC, Gary Salamido, NC Chamber of Commerce. Bookmark the permalink. 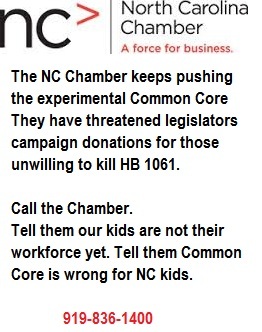 5 Responses to NC Chamber Has To Get The Last Word On Common Core? In all of these conversations that I’ve seen, I’ve never seen a list of what exactly the students are not achieving in school under today’s standards. I can see where colleges can list the remedial courses they teach and say we want high school students to have higher proficiencies in math that shows a solid grasp of Algebra so they are ready to enter Math 101 for example. But, I have not seen a list of skills or knowledge that are desired by businesses. Have you? When we know WHAT students are lacking, then we can focus on making improvements in those classes. The talking points from the Chamber and the business community seem to be just at — talking points. Lofty and empty platitudes using buzzwords meant to sound like they know what each of our kids should be learning. Yo, Anyone Got Food Stamps For Sale?